This tooth #30 was diagnosed with a necrotic pulp with chronic apical abscess. Large periapical lesion noted, 4mm pocketing, class II mobility with large subgingival/subcoronal repair. Proper diagnosis indicated that this lesion is a true endodontic lesion. Therefore, endodontic therapy should yield good results. 3 year recall illustrates complete endodontic healing. 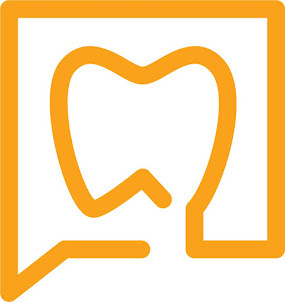 The tooth is completely asymptomatic and functional. A new coronal restoration to include the previous repair done on the distal is recommended to prevent coronal leakage. 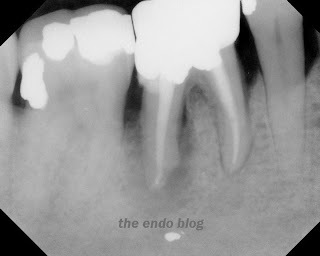 Jason - when you say "true endodontic lesion" does that mean there's no other infection involved? Forgive the basic question :-) I've just never heard the above term before. Good question. 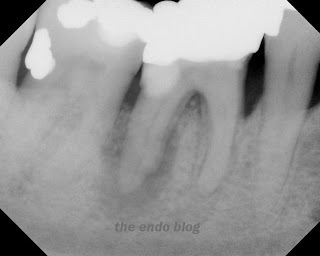 When I say a "true endodontic lesion" that means that the lesion is of endodontic origin. In other words, it is not a combined endo/perio lesion. 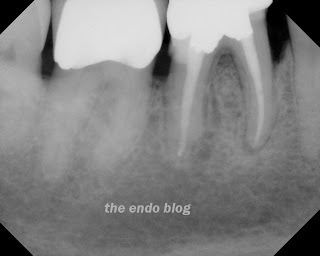 There are a couple of kinds of perio/endo combined lesions, ie. periodontal infection that has led to an endodontic infection (primary perio/secondary endo), or an endodontic infection that has lead to a periodontal infection (primary endo/secondary perio). My point of this post is that with improper diagnosis, this tooth would have been condemned with a vertical root fracture or hopeless periodontal disease and been extracted. It still has restorative issues that must be corrected for long term success (new crown), but it has healed. Great blog!! Sure, I´ll visit it daily .Your cases are brilliant, great skills non-surgical and surgical. Jason, with a 4 mm pocket in this case, i reckon it probably shouldn't have been an endo lesion entirely, but an endo -perio lesion. also since the nature of the situation was chronic, would it have required flap reflection and curettage of the periodontaium following endodontic treatment(to eliminate granulation and promote the chance of re-attatchment..)? Are you suggesting that periodontal surgery would have improved the healing? It does appear that there may have been slight distal bone loss, but it seem like less than 1mm, and that could also be attributed to the new restorative work. In a situation like this, I alway treat the endodontic lesion first and if there is a residual periodontal problem, then address it secondly. It appears that the endodontic treatment has completely resolved the issue. Great blog!! Sure, I´ll visit it daily .Your cases are brilliant, great skills non-surgical and surgical. Thanks.